Cherries come in two types, tart and sweet, and tart cherries are classified into two groups: Amarelle cherries have red pigment in the skin with clear flesh, and morello cherries have red pigment skin and flesh. You can use tart cherries in pies, preserves, salads, side dishes and juices. Tart cherries contain phenolics, plant compounds with antioxidant and anti-inflammatory effects, and the juice has been used to treat a variety of conditions, including muscle pain, arthritis and sleep disorders. Tart cherries contain high levels of anthocyanins that possess antioxidant and anti-inflammatory properties. They have a similar effect to non-steroidal anti-inflammatory drugs that athletes typically use during a competition to prevent and reduce pain. In an article published in the May 2010 “Journal of the International Society of Sports Nutrition,” researchers used a double-blind, placebo-controlled study of 54 healthy runners to determine the effectiveness of tart cherry juice on muscle pain. The runners were given tart cherry juice or placebo cherry juice twice daily for seven days, and their pain levels were assessed before and after a race. The runners given tart cherry juice reported significant reductions in post-race pain. Tart cherry juice reduces swelling, inflammation and oxidative stress. 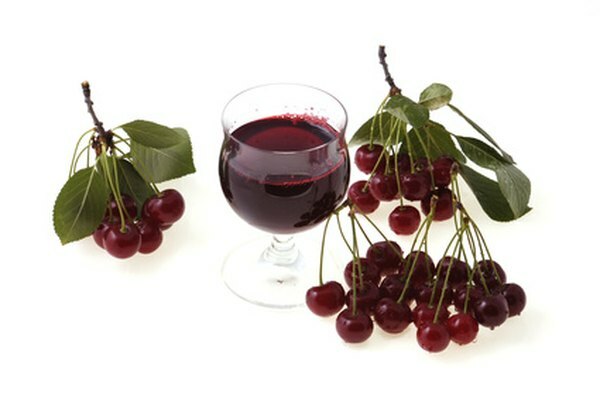 The runners study assessed that tart cherry juice is a natural anti-inflammatory that has been shown “to reduce circulating concentrations of inflammatory markers.” Tart cherry juice is a traditional homeopathic treatment for arthritis, and the study concluded that the anti-inflammatory properties of tart cherry warrant further studies in relation to the treatment of arthritis. Drinking a glass of tart cherry juice in the evening may help you get to sleep easier. A study published in the June 2010 “Journal of Medicinal Foods,” found tart cherry juice helped insomnia patients get to sleep and sleep better. The sleep study followed 15 older adults with chronic sleep disorders over a two-week period. The group given tart cherry juice showed significant reductions in insomnia severity, but not in total sleep time. Drinking tart cherry juice can improve overall health in healthy older adults, who have less resistance to oxidative damage. Tart cherry juice can improve antioxidant defenses. A 2009 study by the Kronos Longevity Research Institute in Arizona found that consumption of tart cherry juice improves the body’s ability to repair cell damage and reduce the effects of free radicals. Michigan State University: What Is a Tart Cherry?